State Testing can drag on.... and on.... and on! Encourage your little ones to do their best with a little treat before the test. 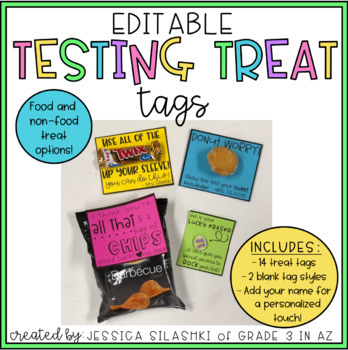 Add these tags to various food and non-food items & motivate your students! NO PREP! Just type in your name, print on colored paper, and add the treat! If you use this product in your classroom, I'd love for you to share on Instagram and tag me @grade3inaz so that I can see! Thank you so much for your purchase and support.